September 12, 2017 — Houston, Texas — Oceaneering International, Inc. (“Oceaneering”) is proud to announce being selected as a finalist in three award categories for the 2017 World Oil Awards. Numerous entries were received for each of 18 categories and a select number of finalists were chosen by an independent panel composed of industry leaders. This marks the first year that Oceaneering nominations advanced as finalists. E-ROV Concept, a self-contained, battery-powered work class remotely operated vehicle (ROV) system deployed on the seabed, for the New Horizons Idea Award. 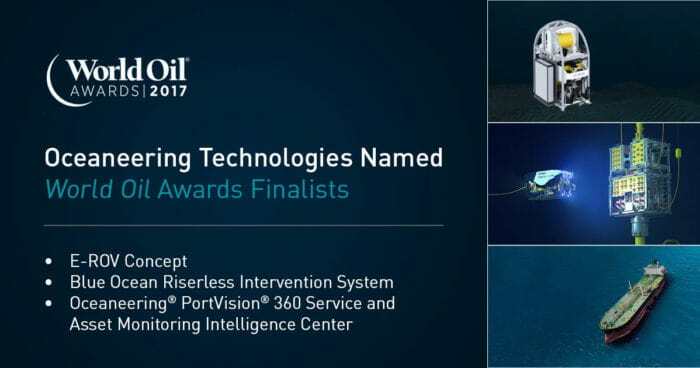 Oceaneering® PortVision® 360 Service and Asset Monitoring Intelligence Center, AIS-based vessel tracking paired with 24/7 remote monitoring of offshore assets, for the Best Visualization and Collaboration Award. Blue Ocean Riserless Intervention System, a reliable, efficient light well intervention solution rated to 10,000 feet, for the Best Well Intervention Technology Award. The winners of this year’s awards, in a program focused on “Honoring Groundbreaking Strides in the Oil and Gas Industry,” will be announced at a gala held October 12 in Houston. To learn more about the 16th annual World Oil Awards, including category descriptions, please visit: www.worldoil.com/events/wo-awards/home.